It says I have poor approval odds as my score is between 680-690. I tried applying directly to AMEX website and got approved in 30 secs for 1K limit. I am just building my credit and only owns secured cards. I read thouroughly the terms and conditions on getting the $150 bonus and you have to be aware on conditions that will disqualify you from getting one. Also, you'll get the bonus 6-8 weeks after your first 3 months of approval. Overall, their terms and conditions are fair. I applied solely to do a balance transfer. I had "excellent odds" and was approved. I was only approved for a credit line of $1,000 with a 718 credit score. I had to rub my eyes to make sure I was seeing that right. I got approved for 10k on another card a year ago easily but this "balance transfer recommendation" card was a huge let down. Okay, so I did not want to rush and write a review after my first impresssion, since it was not a good one. Allow me to elaborate. After spending two years repairing my credit and with a CS of 650 at the time, I applied for this credit card because A)CK said I had good approval odds, B) I was sent a pre-approval letter for another one of their cards, so I figured I had good chances, and C) this card has a cash bonus offer when I applied( $150 if I remember correctly) after spending only $1000 within your first three months. Although I did get approved instantly for $1k, they failed to inform me that i did not qualify for the cash bonus offer due to my credit score. Honestly, had I known this before, I woud not have applied. I then found myself with a credit card from a company that I resented already, but used it anyway for everyday purchases such as groceries, gas, and other bills always making sure to pay it off as soon as the charge was posted, always keeping a SUPER LOW balance. They have increased by CL twice since, and I have accumulated a significant amount of reward dollars and you can use them towards a lot of cool things, not just statement credit. They also have offers that you can add on your card to get cash back when purchasing from certain stores, restaurants and hotels(Levi's, Lulu's, Omni Hotels, CPK, MAC, Ray-Ban, etc) This absolutely changed my perspective and although it would have been nice to be eligible for that sign up bonus, this has become my go-to card. RE Customer Service: I initially called them when I spend my first $1000 to find out why the credit was not posted. They answered quickly and the operator was very efficient and clear about the procedure of opening the inquiry. I received a call back the next morning. I was in class so I did not answer and they left me a message. I was very impressed they called me and I did not have to be pursuing them to get the answers I needed. They did not have a resolution at that time, but they wanted to let me know they were looking into it and someone would call me. I did receive a call a couple of days later with the dissapointing news I mentioned above. Although I feel the offer was misleading, their service was outstanding and I have zero complains. my score is 670 average, got approved for 1k limit instantly when I applied to AMEX website directly. I use it most of the time and pay it as soon as the balance is posted so I am not losing my limit. Then I used it to buy an airline ticket. I reached the $1k purchases in a month with good payment history and I was pleased that they credited the $150 bonus on my first statement. Go to credit card for cash back. Approved with 676 credit score with 5k limit. Very happy. Applied for this card with 772/771/756 score and instantly got approved for $18600. It’s the same limit I have on my highest limit card. there’s a twist redeeming cashback that you cannot redeem it below $25. 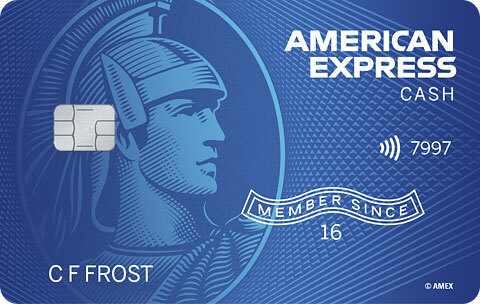 Amex does it again! This is my third card! I love how quickly they apply the bonuses after you meet your requirements! Great credit limit, and no interest for 15 months is a great option if needed! This is my current go to card! I’m glad that I applied early, I’ve already met my requirements for my additional 100 dollar bonus! I recieved a total of 250$! What I don’t like is that they don’t allow you to earn the cash back portion in addition to the signup bonus, but that’s ok! Not having an annual fee is a good trade off! Was the balance transfer free or did it come with a fee? Thanks in advance. The reards points is very slow ever getting posted to your account. I have called and chatted and the chat said I did not have any coming then they said I had them but they were still in pending. My statemnt closed and after 9 days they still wasn't posted to my reards total. I have another American Express Card and it is great but for some reason this card is slow posting anything right. I applied for this card with an EX score of 729 and CK says I had Fair odds with a cs of 697. I went to their website to apply to make sure I got the welcome bonus. I was instantly approved for 2k. I think I got a low limit because I only have secured cards and this is my first unsecured one. I have secured BOA and Disco. No collections and a car loan I just payed off. Credit history 11 yrs. Hard Inquires 9. I live in California and 95% of the lenders are pulling Experian so my Experian inquries are terrible. Payment history is at 100% payed on time. Total accounts only 5. Keep your limit to 30% or less and you'll be just fine. That bonus way sooner than 6 weeks. You will see that credit very soon after reaching it, like in days.